If you’re reading this, you’ve probably either signed up for our free NHL tips or you’re thinking about it. Or perhaps we’ve gone on a long winning or losing streak. Either way, this is an important article to read. The first part of this article is designed to make sure you know what to expect from our free NHL betting tips. How many picks to expect, when to expect them, what type of information you’ll get, that sort of thing. The second part is to make sure you have realistic expectations, especially if you’re new to NHL betting. We don’t want you to get carried away and start betting over your head when we go on a hot streak. We also don’t want you to give up on us too soon if we go cold for a while. 1. We typically average around 3 tips per day. We can’t guarantee anything, though, because some nights there are just 2 games scheduled and other nights have all the teams in action. We won’t “force” a bet just to get to 3 tips that day, and we might have more than 3 if there are several bets we really like. 2. We’ll almost always highlight a pick as our Best Bet of the day. We recommend betting this game if you’re only going to bet one of our tips. Typically it’s the game we believe has the greatest chance of winning. So if we tip a -150 favourite and a +120 underdog, we might like both bets a lot, but the favourite will probably be the Best Bet. We prefer to risk the same amount on all our bets, but it’s up to you whether you want to bet more on our Best Bet. 3. We try to limit our picks to -150 favourites or less. You don’t need us to tell you that the Penguins are probably going to beat the Avalanche, and it’s not usually wise to lay -200 or higher on your NHL bets. If we do tip a heavy favourite, we’ll try to find a way to limit your risk by taking them to win in regulation, the puck line, first period lines, team totals or otherwise. 4. Our site will feature writeups, breakdowns and opinions on the entire board every Tuesday, Thursday and Saturday. A big goal of ours is to help you become a better NHL bettor, so it doesn’t make much sense to just spoonfeed you picks. Last year (2016-17), we posted full breakdowns and opinions on every game, 6 days per week. That turned into a pretty time-consuming job, so we’re dialling back that feature this season (2017-18) to every Tuesday, Thursday and Saturday. Those days are the busiest days of the week on the NHL schedule, while Mondays, Wednesdays and Fridays are the lightest. Don’t worry, we’ll still be putting out picks on Mondays, Wednesdays and Fridays, we just won’t be putting up lengthy posts on our site on those days. In every post we make on Tuesdays, Thursdays and Saturdays, we’ll include a game breakdown for every betting pick we make. At the bottom of the post, we’ll also offer our opinions (leans) on the rest of the games, bets we considered but that didn’t quite make the cut. If you agree or disagree with our logic, or you think there’s an angle we missed, let us know in the discussion area at the bottom of that day’s tips page! We’d love to hear your opinions. 5. We try to email out our daily tips by 3 p.m. Eastern Time (earlier on Saturdays). We have followers across the world, not just in North America, so we want to get the picks to them before they have to go to bed. You also want to have the picks in enough time to think about what bets you want to make as well and actually place your bets. So around 3 p.m. eastern is the time when the emails will go out listing all of that day’s picks, breakdowns and leans. The emails will go out earlier on Saturdays, when there are often afternoon games on the schedule. 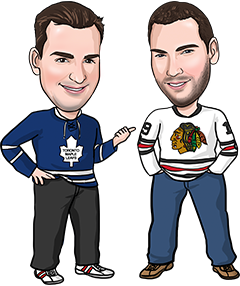 In order to make sure you get our NHL betting tips as soon as possible, subscribe to our email list or follow us on Twitter and Facebook! We’re not going to win money every night. Or every week. Or even every month. Not even Billy Walters, who is widely considered the most successful sports bettor in the world. Professional sports bettors can make a great living if they win 55% of their bets against the spread. That means they’re wrong 45% of the time! Flipping a coin is a 50/50 proposition. Do it a few hundred times, however, and you’ll see streaks where it lands on tails 5-6 times in a row or more, and the same with heads. 55/45 propositions will be streaky too. Hockey betting can be even more of a roller coaster. So many games end with a 1-goal difference, many of them decided in overtime or a shootout. A lot of times, games are decided by a puck bouncing in off a skate, shinpad or defenceman’s stick. And how many times have you seen a team dominate the game but lose to a hot goaltender? The point is that there are a lot of variables in sports betting, especially NHL betting. If you have a couple of games in a row where your team gets all the bounces, you can easily go on a huge winning streak. This doesn’t mean you’re invincible or a genius, and it definitely doesn’t mean you should start betting more. You can also go a few games in a row where you can’t seem to catch a break, and you’ll suddenly be in a losing streak. Don’t panic, and resist the temptation to start risking more to make up for your losses. Over time, those bounces even out. We’ll have both winning streaks and losing streaks. Our goal is that after a few hundred NHL bets, we’ll have won a few more units than we lost. Our advice is that if you’re going to follow our NHL betting tips, follow for a long time. If you measure success on a daily basis, our picks might not be for you. In fact, sports betting in general is probably not for you. But if you’re patient, have reasonable expectations and focus on the long term, we’re confident you can be a winner with our daily tips!